Island Escape | Spa Inc.
Lush temperate rainforests teeming with exotic wildlife. Saltwater fishing excursions and snorkeling. It’s the ideal destination for your island escape, and you don’t even have to head towards the equator to reach it. A 75 minute boat ride or a 50 minute flight from Vancouver, Sonora Resort is located in British Columbia’s Discovery Islands archipelago, just northeast of the Campbell River. The property, surrounded by mature fir and cedar forests and bordered by the lively waters of the Pacific Ocean, combines the charm of a wilderness retreat with the luxury of five-diamond service. After taking a boat to the mainland to watch grizzly bears feed on salmon, enjoying a daylong fishing excursion, snorkeling with the salmon, or trying your hand at archery, you can return to Island Currents Spa for an indulgent treatment or a serene session of Hatha yoga in a cedar replica of a traditional First Nations longhouse. Like the rest of the resort, the spa, a stand-alone structure built in 2008, was constructed in a West Coast style – all cedar beams and stone, with a grand entrance and high porte-cochère. “We’ve been told that our property looks like a mini Whistler,” says spa manager Miranda Moore. Inside the spa are slate floors, wood accents and a prevalence of natural hues, along with the occasional pop of Granny Smith apple green. But the most striking aspect of the decor is the abundance of glass that provides breathtaking views of the outdoors. When she was hired in 2012, Moore says she was asked to transform the spa into a more luxurious establishment and beef up what they had to offer their guests. “Since I’ve been here we have incorporated some new treatments, new product lines, and a yoga program that we offer each day,” she says. Able to accommodate up to 150 guests and perform ten treatments at a time, the spa is served by ten practitioners at its busiest, as well as a spa coordinator and Moore herself. “We have a great team of practitioners and professionals who have a wealth of information [and] are able to have conversations with guests and provide information about ailments and that sort of thing,” she says. The spa includes seven treatment rooms, a wellness centre that houses a fitness facility and floor-to-ceiling windows that look out onto lawns and lush gardens. One of the treatment rooms is configured for side-by-side treatments, while another contains a Bouvier hydro tub with 252 jets and comes with the capacity for colour therapy, which changes the colour of the water and the room. “Water is a very big component to our space,” Moore says. Elements such as the 25-foot floor-to-ceiling water walls on the first and second floors, whose sound resonates throughout the spa, and the Therapeutic Channel water journey, which consists of five different stations, are all meant to echo the tides surrounding the island. 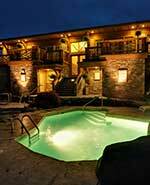 The Therapeutic Channel water journey includes a sauna and steam room, warm and cool mineral pools, and a Swiss shower. “When used in the suggested order, the water journey will help to increase circulation, detoxifying the blood,” Moore says. The use of the spa’s water facilities is complimentary for all resort guests. In the treatment rooms, clients are pampered with high-quality spa products such as Seaflora, Jane Iredale, and Sapino. Island Currents Spa is part of Valmont’s V35 Club, an exclusive 35-member group that includes some of the most luxurious hotels in the world. Through this partnership, Island Currents is able to incorporate the Swiss brand’s unique anti-aging products into their signature treatments. In particular, Moore sings the praises of their Ultimate Face and Body treatment, which uses Valmont’s Elixir des Glaciers and includes a collagen mask and body scrub. “I’ve worked in this business a really long time and it’s the only product line that I’ve come across that is really results-oriented in a very short period of time,” Moore says of Valmont. Another signature treatment on offer at the spa is the Sea to Cedar treatment, which uses Seaflora products. The experience begins in a hydro tub, then moves to a rock weed exfoliation, purifying mini facial, a rinse in the shower, and a relaxing massage with cedar wood oil. “A very Canadian experience,” as Moore describes it. Yet another treatment, the Canadian Balsam Deep Tissue Massage, incorporates a Sapino massage oil that contains Canadian balsam essential oil. It’s hard to say which has the most impact, the quality of the spa treatments or the rich natural environment in which it is set. Perhaps it is a bit of both.